Businesses interested in purchasing an intruder alarm system in Milton Keynes often turn to 1st Choice Security Systems. Milton Keynes is a bustling town with a diverse economy that supports more than 22,000 companies. The types of businesses that have chosen to set up in Milton Keynes range from small startups through to major international corporations like Konecta and Brioche Pasquier. There are thousands of small businesses located in the town including numerous restaurants, cafes, and tourist ventures. The business community in Milton Keynes is very successful and helps to make the town a pleasant place to live, with a low unemployment rate and high level of prosperity. The many successful businesses in the area help provide employment and training to the town’s population, helping the municipality flourish. 1st Choice Security Systems has visited Milton Keynes on many occasions to help local businesses secure their properties. We know that local businesses are particularly concerned about securing their properties overnight and during the weekends — something we can help them with in areas such as Furzton Lake, Theatre District, Granby, Bletchley and the The Hub. By using the security services that 1st Choice Security provide, business owners can rest assured, knowing that their business is adequately protected. Business security is more important than ever, because criminals have more technological tools at their disposal. They can track the movements of business owners, thanks to social media, and attempt to burglarise a premises when they know the business owner is far away. Both 1st Choice Security Systems and the Milton Keynes police suggest that a professionally installed intruder alarm system is the most effective tool for protecting unattended property. Our talented team of security professionals can install a modern intruder alarm system in Milton Keynes that protects your business and deters criminals from breaking in. 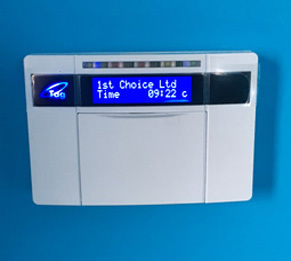 If you wish to learn more about installing an intruder alarm system in Milton Keynes, contact 1st Choice Security Systems on 0800 118 2414.
has been installing commercial security systems in Milton Keynes for more than 10 years. Before installing any system, one of our security consultants will identify the unique security risks that are faced by your business. We will look at the location of your business, the security infrastructure in the neighbourhood, the assets held on the property, local crime rates, the access points on the property, and daily employee movements. After our security consultant has a strong understanding of your business, they will recommend a security system that is reliable, effective, and easy for your staff to use. Our commercial security systems contain various security components including access control systems, intruder alarms, and camera surveillance. All commercial security systems in Milton Keynes that are installed by 1st Choice Security Systems feature an intruder alarm system. This is because intruder alarms are a proven deterrent against criminal activity and insurance companies usually insist that a professionally-installed intruder alarm be installed at every business premises. As any smart business person knows, any investment that you make should have a strong return on investment. This is particularly true for business security systems, with even the cheapest models being capable of saving you thousands of pounds. The intruder alarm systems are referred to as “bells only” security systems, because they simply ring an alarm when an intruder is detected. While this type of alarm is very effective, many people have become desensitised to the sound of alarms. This is because they are constantly hearing intruder alarms and car alarms in their local neighbourhood. This type of alarm relies upon another business owner or neighbour hearing the alarm and contacting the police. We install more effective business security systems in Milton Keyes, which send an alert to an Alarm Receiving Centre when an intruder is detected. A message is then forwarded to nominated staff members or directly to the police department. If you wish to have your alarm notify the police department, you will require a registration number that is only available if you use a professional security company. Intruder alarm systems contain complex technology that should be regularly maintained and tested. We have had a number of clients in Milton Keynes who have discovered their old intruder alarm systems were actually faulty and incapable of detecting intruders. Our security technicians were able to repair their systems and ensure they remained functional. Our alarm system maintenance services are fast, reliable, and efficient. If you have had issues with false alarms or you don’t think your system is working reliably — just call us!